As I mentioned on Ravelry, these socks were made for a sweet little 12 yr old girl who loves to bake and cook. She is a bonafide FOODIE! Since my projects are all named after some type of video game reference, Cooking Mama was a no-brainer. I decided to use the pattern “Coquette” found in the book 2-at-a-time Socks. 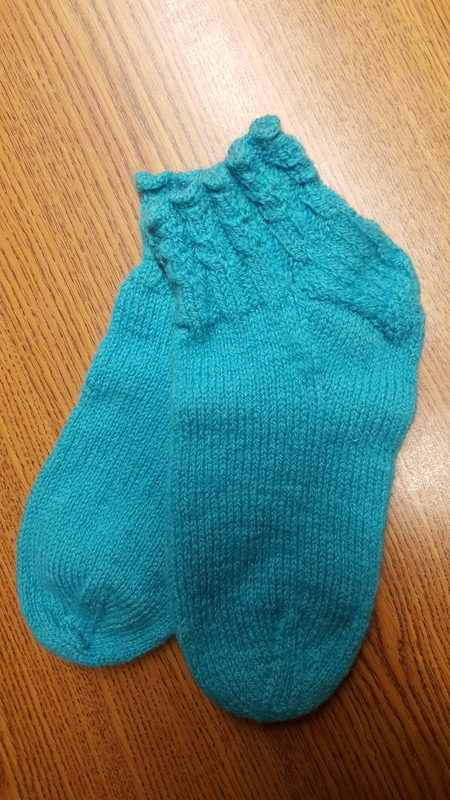 While I did not knit the socks by the book’s method, I stayed true to the pattern itself. I followed the pattern for the smallest size: 5. I had the correct gauge after dropping down to smaller needles than stated in the pattern. 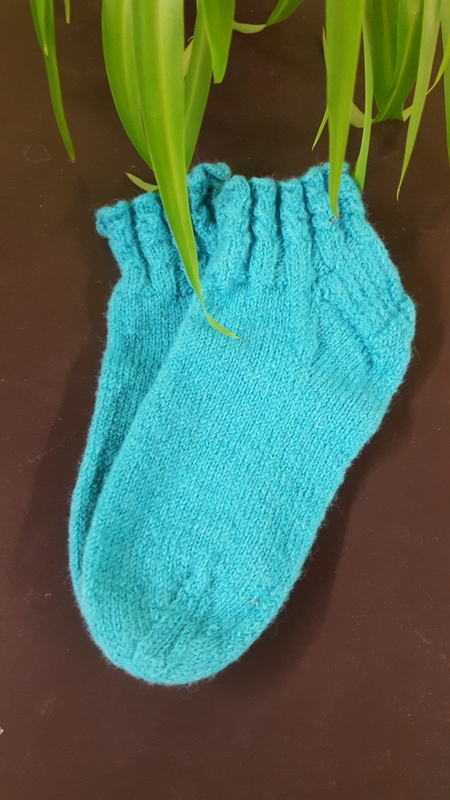 I knit one sock at a time, on a set of 5 dpns. I began the first sock in the spring, and the second one in mid to late summer. (got married and did NOT do much knitting on the honeymoon. Sorry yarnies!). Upon completing the cuff for sock #1, I did not think it resembled the picture in the book. I reworked it two more times with the same result. When I completed the cuff for sock #2, it came out exactly as the first, but still did not resemble the photo. At that point I did not care; I liked the outcome. I hand washed them both, then tossed them into the dryer (gasp!) for about 5 minutes. I checked them in 5 minute intervals until I obtained what I thought was the perfect size, based on her template. The socks felted slightly, but not enough to lose any of the stitch definition and ease. Then I laid them flat to finish drying. I am pleased to say that they are now a sock I feel proud of giving as a gift. I know they will fit her snugly and perfectly and not slip down inside her boots. The yarn is Knit Picks Palette in Caribbean, a color she picked out over lunch one day. I just want to add that the photo here: (Coquette) that accompanies this pattern on Ravelry look enormous on the wearer as well. Knitters, be aware of this. If I were to make these again, I would work with fewer stitches if making the small size, or knit one size down. Oh, there is one more thing. After losing progress on these socks twice after leaving them within reach of my plucky 92 yr. old mother-in-law, I switched over to the ‘magic loop’ method. Not bad…not bad at all. I had fewer gaps, and never dropped a stitch! While I am not giving up on dpns, I do recommend learning this technique for projects that travel with you. I cannot guarantee that the magic loop is mother-in-law proof…you are on your own there! Previous Previous post: Holy Week! Next Next post: Why Do I Knit?